Dubai, United Arab Emirates: The Dubai Culture & Arts Authority (Dubai Culture), the Emirate’s dedicated entity for culture, arts and heritage, have wrapped up their participation in the third edition of the Global Islamic Economy Summit 2016 as an official ‘Knowledge Partner’. The Summit took place 11 – 12 October in Dubai under the patronage of His Highness Sheikh Mohammed bin Rashid Al Maktoum, Vice President and Prime Minister of the United Arab Emirates and Ruler of Dubai. As Knowledge Partner of the Summit, Dubai Culture collaborated with ‘1001 Inventions’ – an award-winning international science and cultural heritage organisation focused on raising awareness of the creative golden age of Muslim civilization – and delivered a special instalment inspired by ‘House of Wisdom’ that showcased Dubai Culture’s ‘Creatopia’ virtual platform for the creative community. One of the features delivered during the Summit was an augmented reality show to educate the visitors about the ‘House of Wisdom’ platform. The Authority’s participation included commissioning a number of Creatopia artists to perform live painting and ceramic painting at the dedicated ‘Art Pavilion’ organised during the Summit. Co-Founder and Managing Director of 1001 Inventions, Ahmed Salim, said: “Our cooperation with Dubai Culture & Arts Authority was a great honour. We are delighted to have shared aspects of the history of Islamic civilisation to the public – one that lasted over a thousand years starting from the seventh century and attracted the best and brightest minds from a diverse set of religions and cultures to build a golden caliphate of creativity and innovation that is still a guiding light for today’s generations. 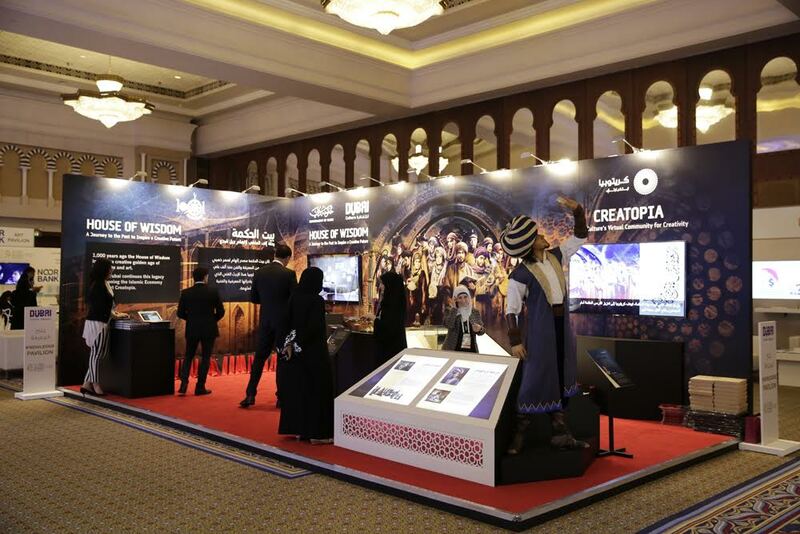 Highlighting this golden caliphate and ‘House of Wisdom’ as a beacon, and demonstrating the parallels with today’s Dubai-based creative initiatives such as Creatopia, is just one step towards a brighter future.” The Authority’s recent participation at the Global Islamic Economy Summit 2016 reflects Dubai’s ambition to become a global capital for Islamic economy, and confirms its commitment to contribute to the growth of the Islamic economy sector in Dubai as well as working towards increasing the diversity of its national economic future through multiple projects and initiatives. Over two days of continued events, Global Islamic Economy Summit 2016 was held under the slogan ‘Inspiring Change’ and took place at Madinat Jumeirah. During the workshops a host of experts and local and international speakers discussed the challenges and opportunities and debated the fundamental aspects of the Islamic economy, as well as the factors that contributed towards Dubai reaching its position as a leading destination for activities and operations of Islamic economy.